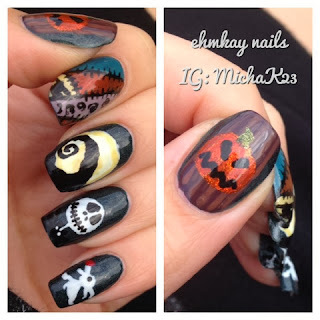 I did these nails last week in honor of one of my favorite Halloween movies. 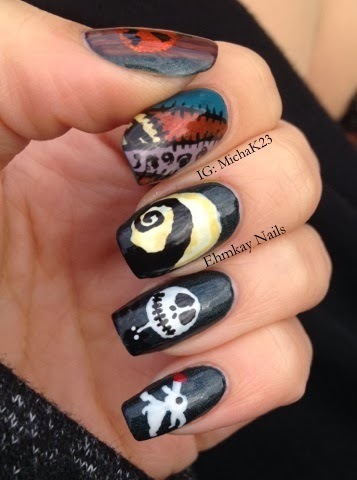 Nightmare Before Christmas is so artistically done that I felt I needed to create a rather simple manicure to represent this movie. 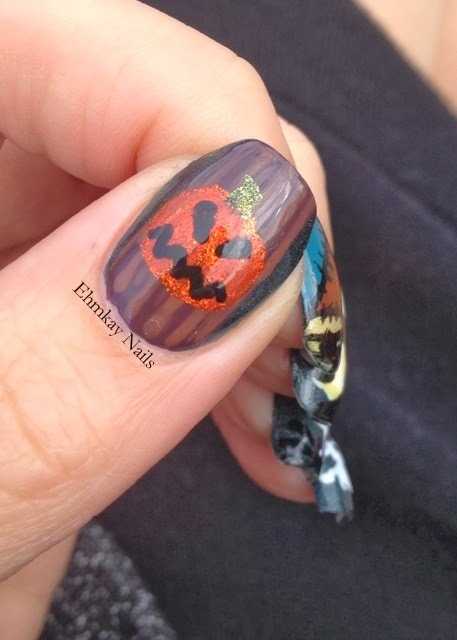 My thumb is the entrance to Halloweentown, on the tree in the woods. 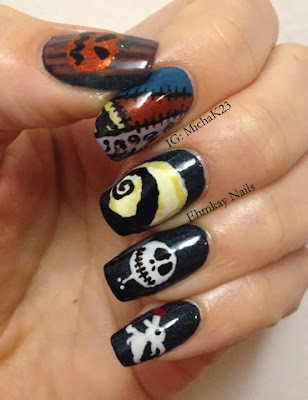 My index nails is the design on Sally's dress. My middle nail is the scene on the movie cover. Then I have a portrait of Jack Skellington. Finally, his buddy Zero. 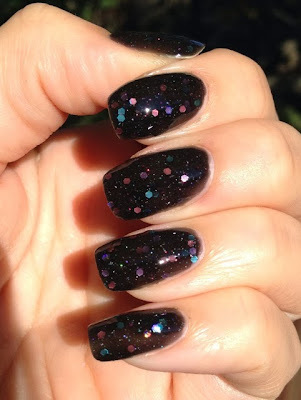 For my right hand, I used Avon Eclipse, Lynnderella Nightshade (how appropriate?) 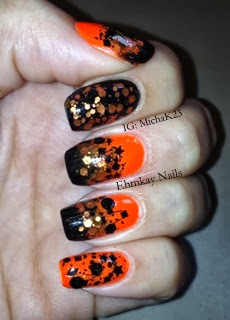 and one of those Rite Aid pumpkin polish with black and moon glitters. I actually entered this into a nail art contest. I have no shot in winning, but if you enjoyed the art, I would still appreciate a "like" by clicking the link HERE and liking my photo. 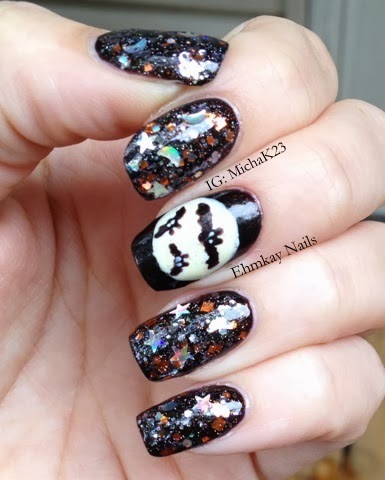 Tomorrow I'll show you what I'm wearing now for Halloween: Halloween bears! Halloween Explosion on My Nails! I don't really know what to call this. I had the idea in my head and I think it came out just like how I imagined it! 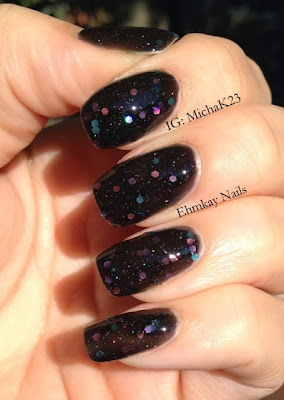 I consider the one glitter diagonal with dots one of my signature manis, and I haven't done it in quite some time. 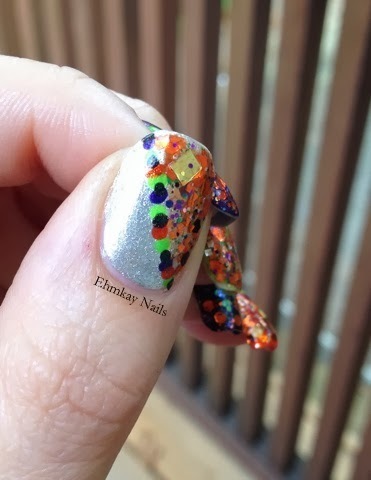 I pulled out a bunch of my "Halloween" glitters and said "This is the best way to use them all!!" 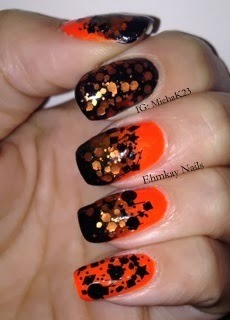 Index: Zoya Savita with Tony Moly Orange Glitter (no names, sorry). Then using the four other colors, I added the dots. These were loud and fun, and really screamed fun Halloween to me. Just a side note: the Tony Moly looks like it is curling, but it's absolutely not. 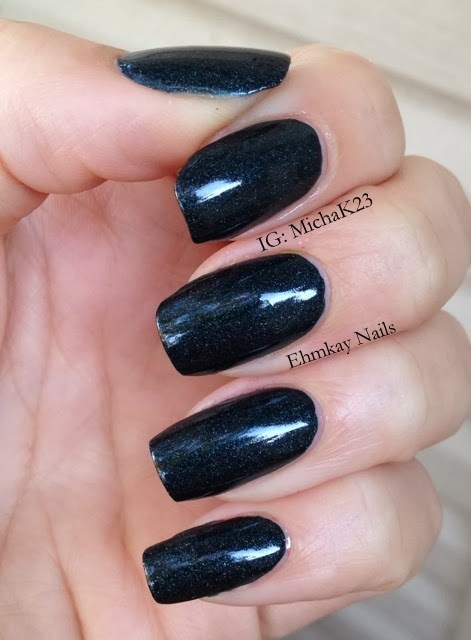 It was completely flat with one coat of top coat. The Lynnderella took three. Oof. 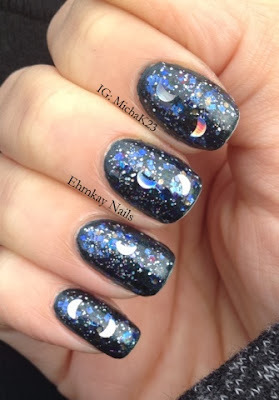 And unfortunately, those nails chipped really fast and gave me a sad. 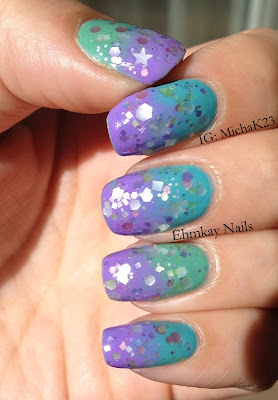 You can see that there was shrinkage with so much top coat too. Oh well. Do you like this simple idea? 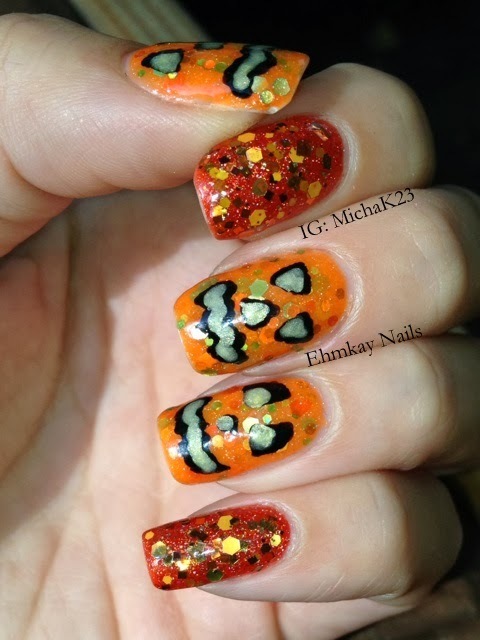 Halloween is so close! I feel like I haven't gotten to do as much art as I normally have (I mean I think it's been like 6 manis), but I do have an epic one to show you! Plus I have one more simple one in my head with this color scheme. 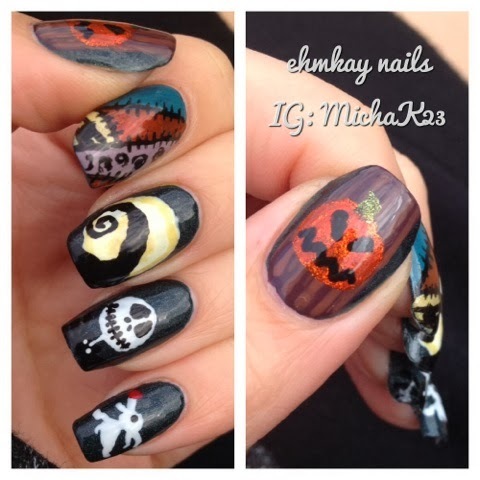 Keep coming back this week for more Halloween and a Breast Cancer Awareness mani! I've already got a few more autumn-inspired manis and comparisons that I've done to show you in November. 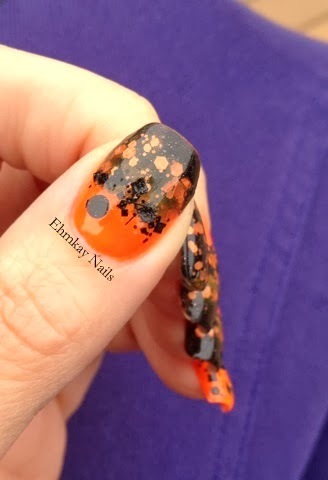 Today I have a tester polish created by Red Dog Designs which was sent over with an epic Halloween package. As you know, Gina creates amazing polishes and customs, and she sent me this one that she was playing with. It's a big win in my book and hopefully she releases it. 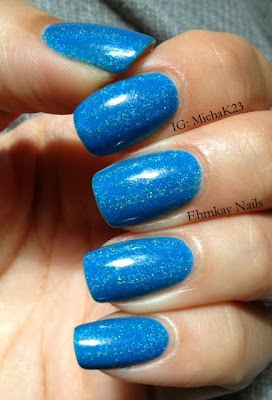 Gina also sent the polish over to Jen at My Nail Polish Obsession (see her post HERE) so we decided to post it at the same time. 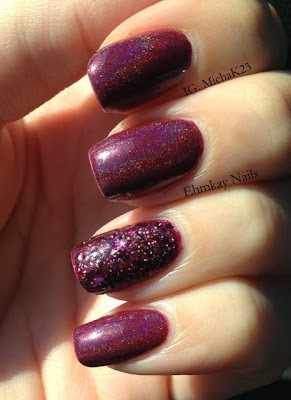 Her version has more of a purple base, so head over to her blog to check out her photos. 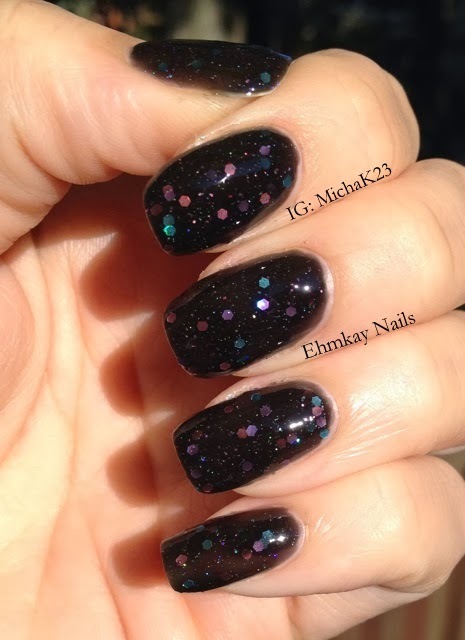 This is just two coats of Betelgeuse--that's what I named it, after the star. Jen's is Perseus because it's too different to give it the same name. 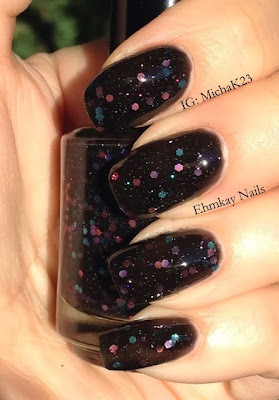 It has holographic blue, pink, and purple hex glitter in a black jelly base with lots of holographic microglitter. 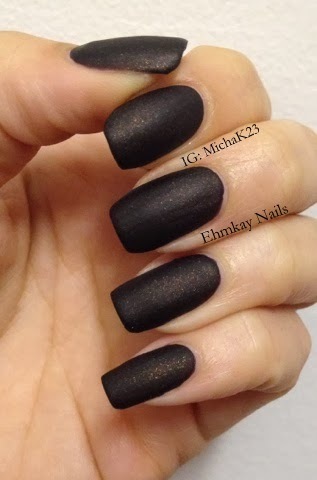 At the first coat, it's very sheer, but builds up to opaque on the second coat. 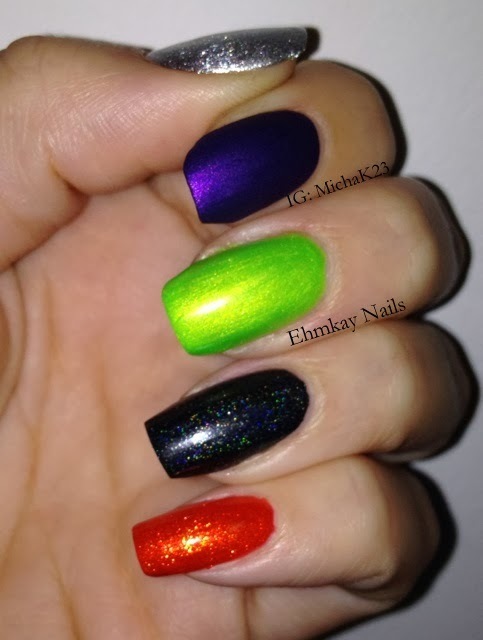 You can purchase Red Dog Designs polishes (including her amazing Halloween collection and Mickey polishes) HERE for $10.00. You won't be disappointed! 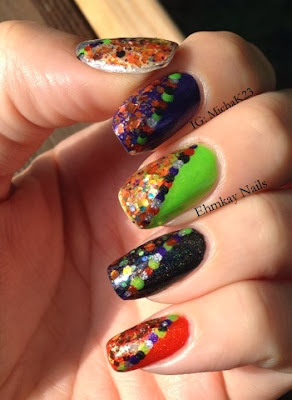 More Red Dog Designs Halloween polishes! This time it's my dream polish, The Haunting Hour! 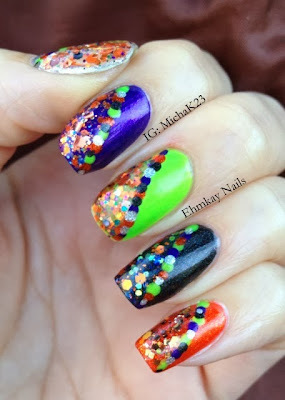 I told Gina I needed a black, gunmetal, and orange Halloween polish. Not only did she deliver, but she DELIVERED. With the added moons and stars, it's just stunning. 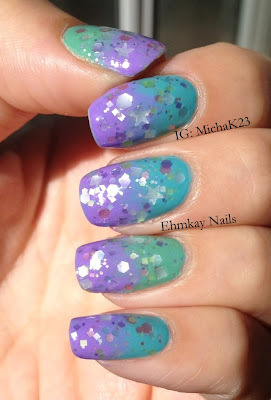 I used ONE coat here. 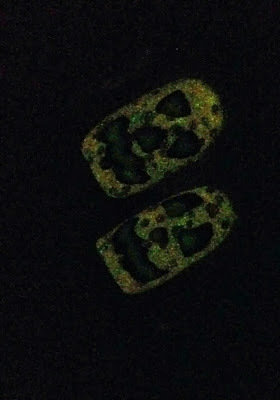 I shook the bottle lightly upside before using it and you can see, I had zero issue getting the holographic shapes out. I just love this polish. 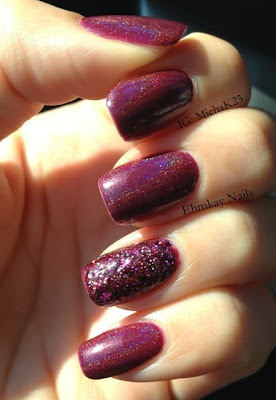 I have one coat over two coats of Sinful Colors Leather Loose (on sale now for 99 cents at Walgreens!) and it's a gorgeous matter brown polish with orange shimmer (pictures at end of the post). I added an accent of a full moon with bats. My original nail art idea didn't work out and I got frustrated and went with something simple. Two coats of Sinful Colors Leather Loose, no topcoat. Oh my gah. I bought this during their 99 cent sale. I just can't. Sometimes I wonder why I ever buy Diors when dollar polish is this good!! 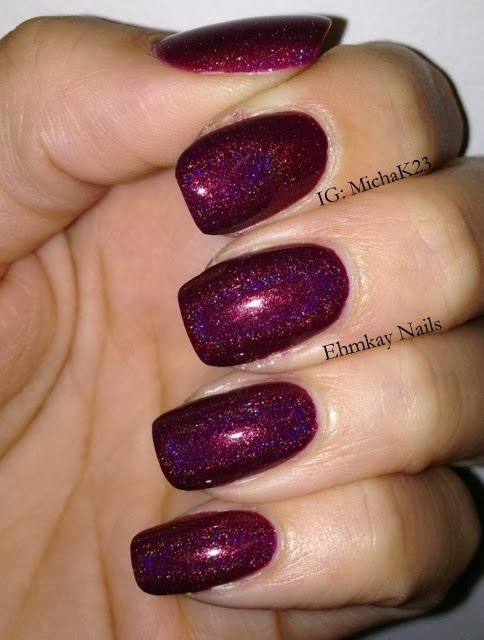 Red Dog Design polishes can be found HERE for $10. 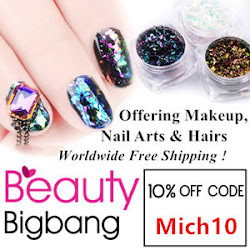 She ships fast and the quality of product is AMAZING. 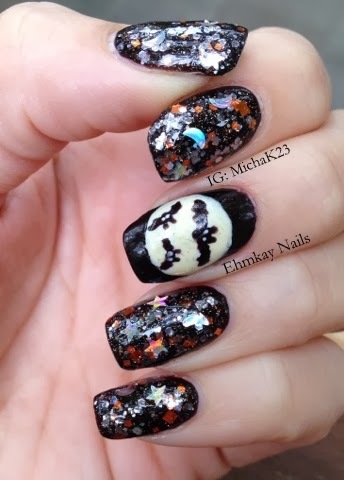 Halloweeeeeeen is my favorite. Here's a super simple Halloween manicure! 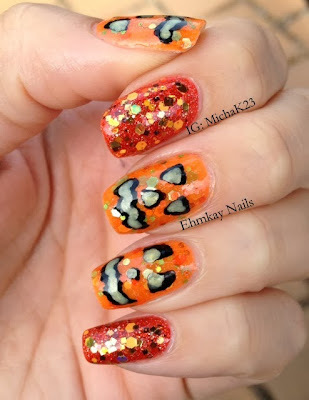 On my index and pinky nail, I have two coats of LA Colors Electric Coral with one coat of Red Dog Designs Pumpkin Toss. 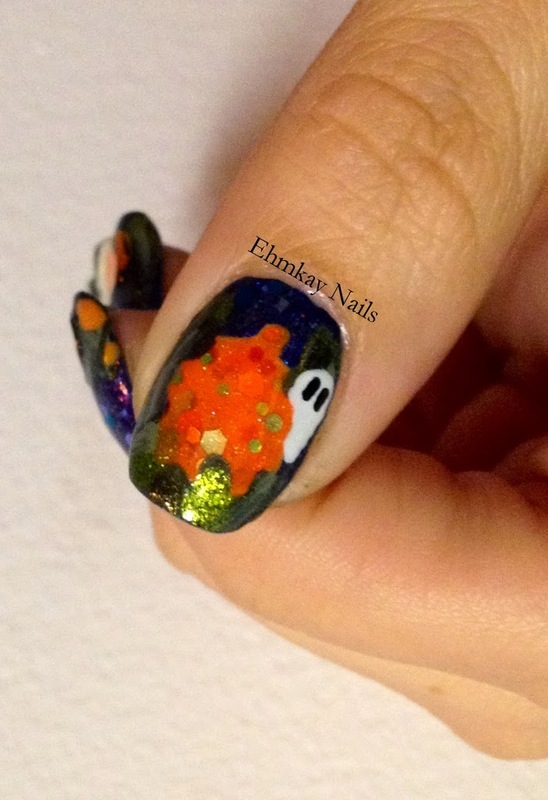 On my other nails I have two easy coats of Red Dog Designs The Great Pumpkin, which is a seriously awesome glow in the dark orange polish! It's awesome! 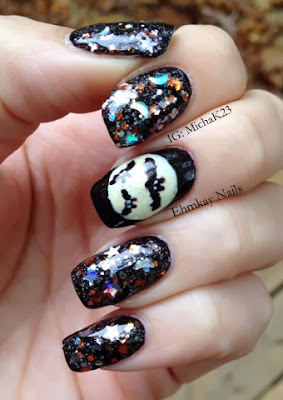 Used a simple black creme, yellow, and a clear glow in the dark polish for the lit within jack-o-lanterns. I realize the glow in the dark pictures are a bit grainy, but I just wanted to show you how strong the glow is! 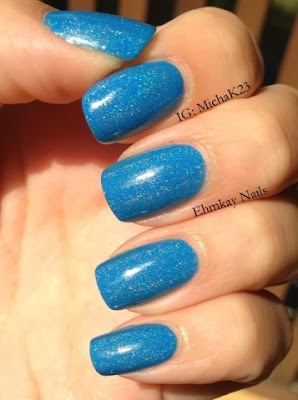 And this was only two coats! 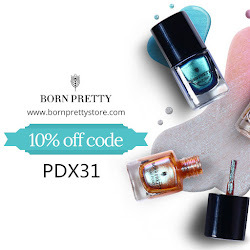 You can find Red Dog Design polishes HERE for $10. This is a real simple take on the Charlie Brown and The Great Pumpkin cover. 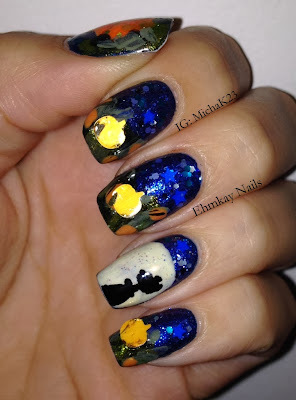 If you remember last year, I did Charlie Brown nail art HERE and HERE. I loved them so so much, so I had to somehow fit little CB in this year. I recreated Snoopy scarecrow in front of the moon and the cover of the Great Pumpkin with the ghost. Both the pumpkin and moon glowed in the dark but I forgot to take pictures, whoops! 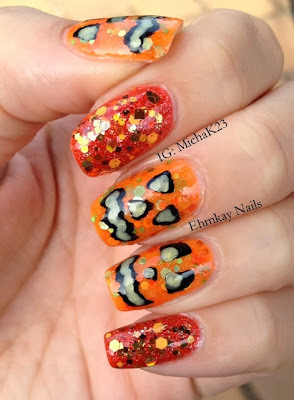 I also used pumpkin glitters as an accent for my pumpkin patch. 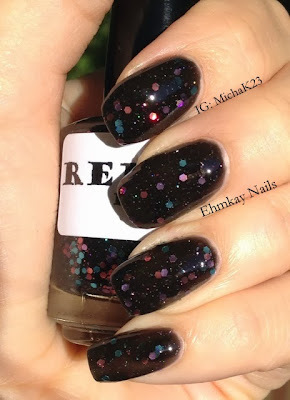 My right hand was Hare Golden Years and Elevation Polish Lake Achit to emanate the night sky. Super pretty. Sorry that my pictures are pretty sparse. Something happened with my camera settings and they came out tiny! These were the only true-to-size photos. Blah. Ohhhh, Halloween is so close! 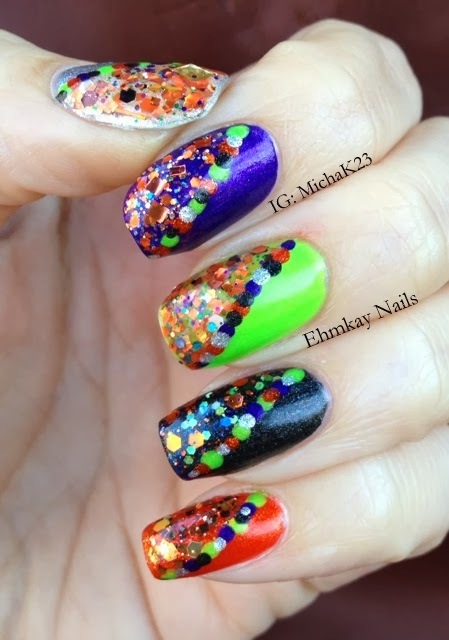 And I've been getting very festive on my nails! This manicure was really basic in theory. 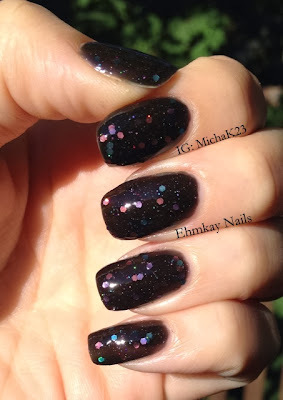 I started with 3 of the Wet N Wild tombstone polishes (such a sucker for those). 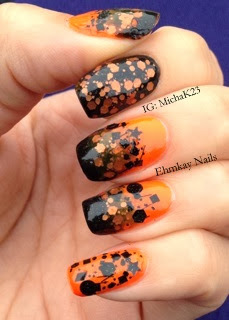 Two coats of Ghouls Rush In (neon orange) and Darkest Hour (black). 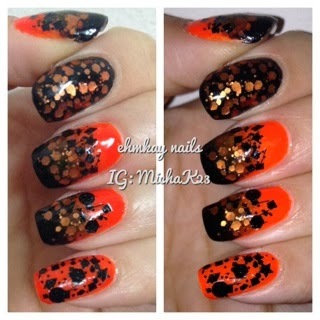 Then I added a coat of Nail in the Coffin over the black to match the shimmer that would be in the black glitter I used over the orange. 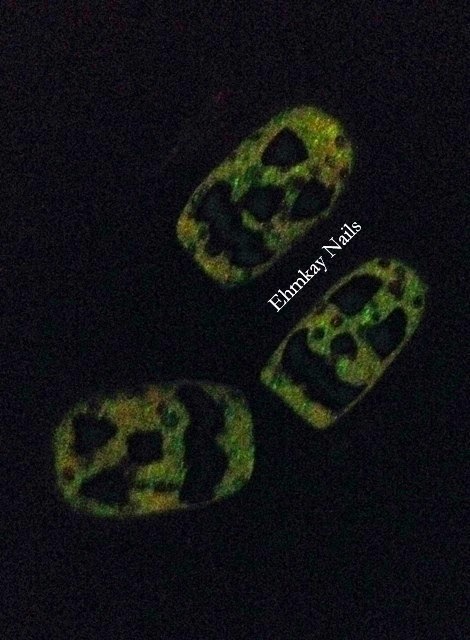 The neon was terribly difficult to take a picture of! 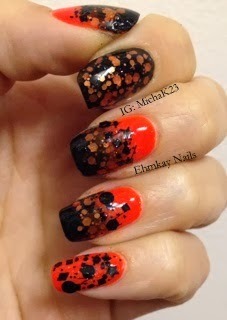 On my thumb, middle, and ring nail, I used Darkest Hour to gradient over the neon orange. 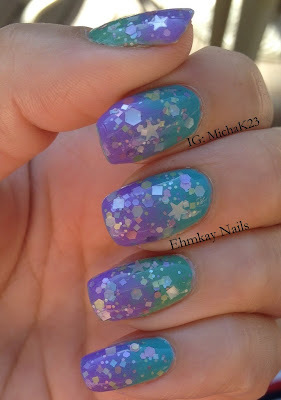 On my index and pinky, I used opposing color glitters. The orange glitter is Nanacoco Lovelipop and the black glitter is a new Cirque polish called Vectors (being released at the end of this month!). Vectors is a surprise glitter for me. I originally didn't buy this one because the swatch was bars and hexes but I went back and got it. 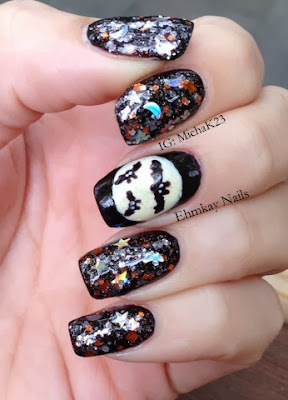 To my surprise, there's stars and circles, and so much other stuff! I then did a gradient within a gradient on my accent nails. 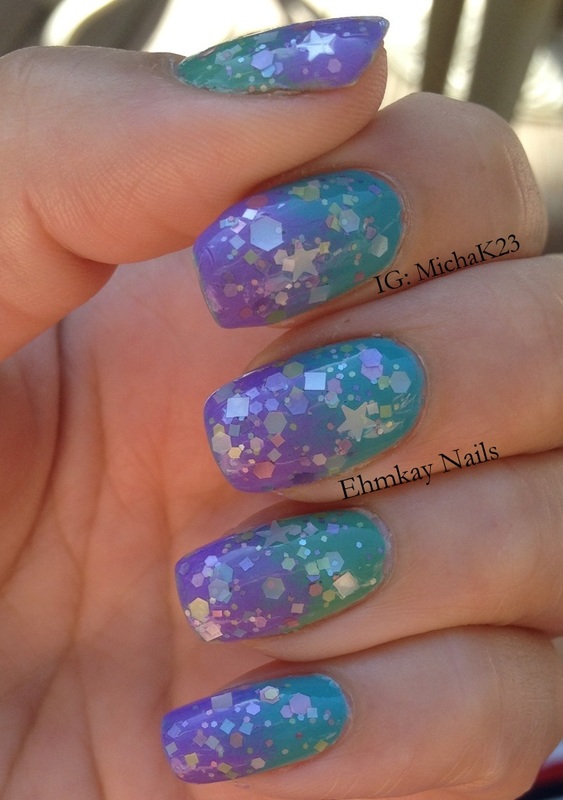 I actually used THIS manicure as my inspiration. 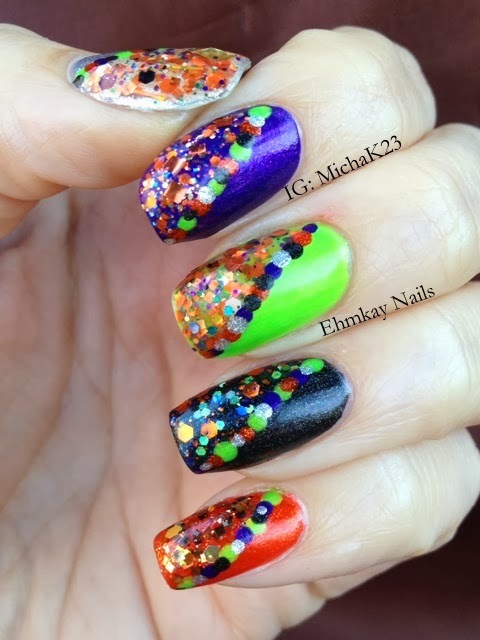 These were loud and screamed Halloween and they are so necessary. Please enlarge these pictures. I'm not sure what happened but my picture size got messed up and they came out really small which made me sad. Whomp. 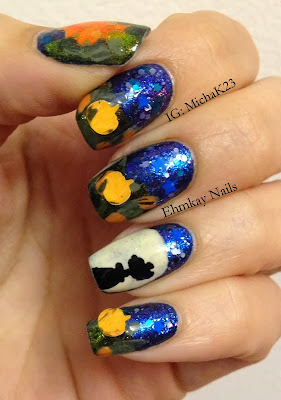 Hope you love these as much as I did! It was 70 degrees today. Hello mid-October. 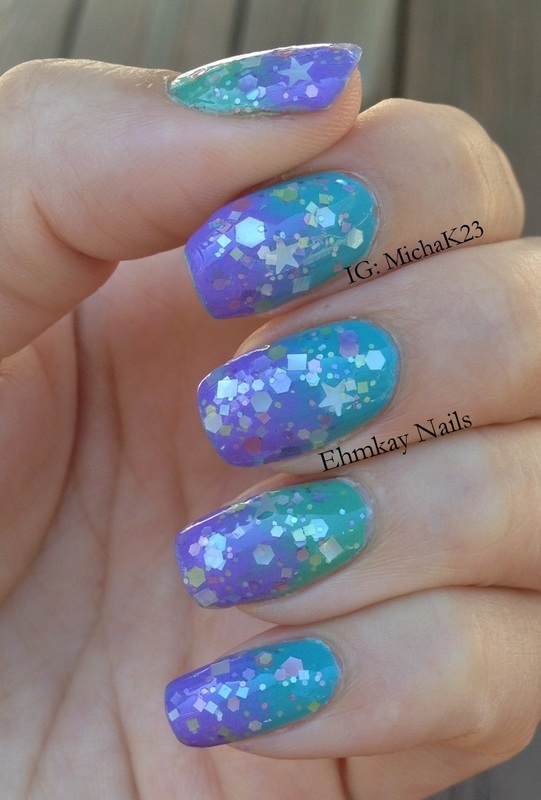 So here's a springy gradient that I did! First I started with the green Dior creme from the Samba duo and Dior Saint Tropez. 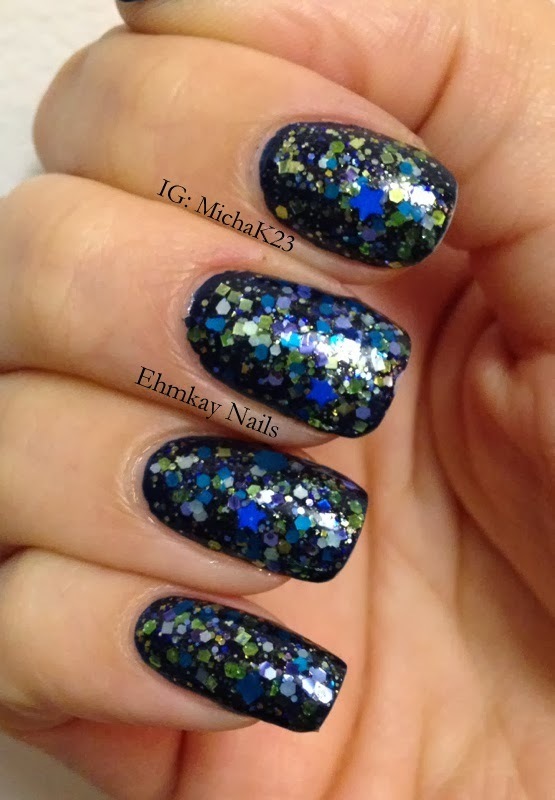 I used the Samba green creme on my ring and thumb nails. Two coats each. Then I added a gradient of Illamasqua Jo'Mina. Beautiful colors together. 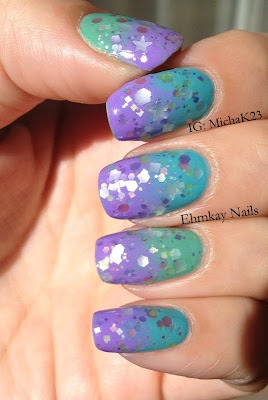 Then I added one coat of Cirque Polish Lullaby, which echoed the pastel colors of the gradient. This is the only pastel glitter I really own, but it's awesome. I turned the bottle upside down for a few minutes so the stars would come out easier, but otherwise, easy to use formula. I snagged these a looooooooong time ago. July seems so long ago! 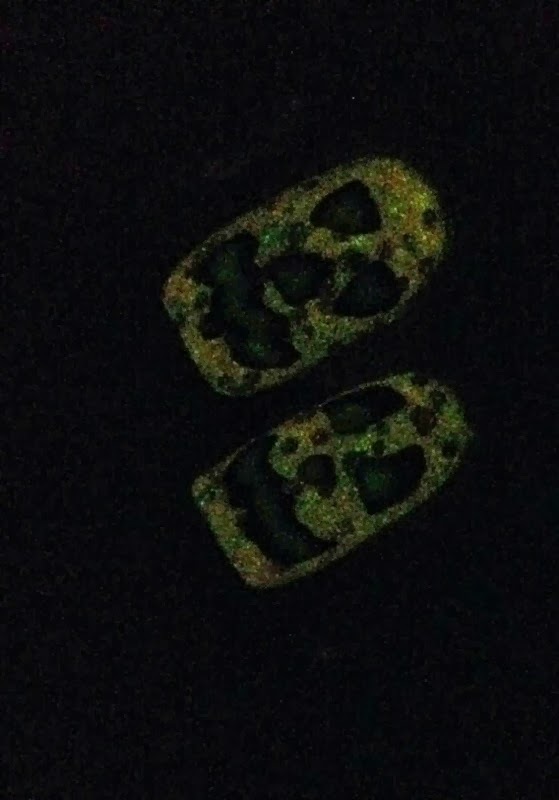 So now that I've finally worn them I thought I'd post them in one post for tomorrow's anticipated restock. 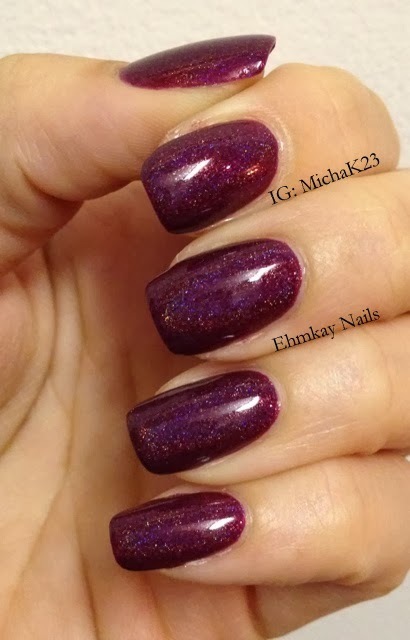 Both polishes went on smoothly in two coats. 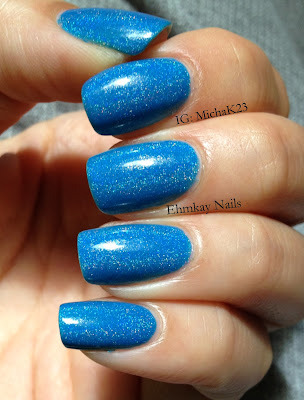 Water for Unicorns is a bright blue holographic polish that sometimes looks more subdued and other times really pops. It's gorgeous. Mr. Burgundy is a deep burgundy holographic polish, and I think my favorite Enchanted so far. Can't believe this was untried for so long. After a day of wearing it alone, I added one coat of Lynnderella Vampink. Absolutely perfection. 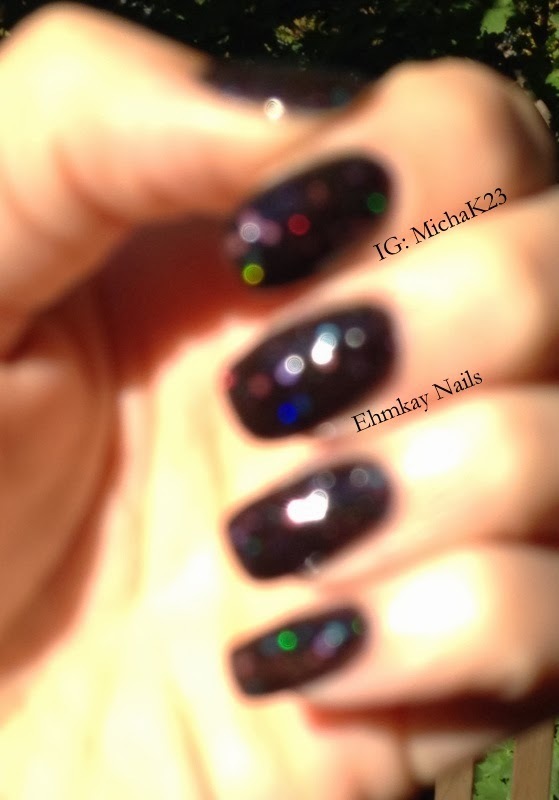 It was also absolutely impossible to capture the sparkle. There will be a restock tomorrow at 3pm EST HERE. I read on her Facebook page there will be some new ones. Hoping for a bright orange one for Halloween.